With the advancements in dental technology, replacing natural teeth now has multiple options for the patient. Patients are no longer limited to dentures or living with a gap in their smile. While dental implants are a regular and effective tooth replacement option, mini dental implants are becoming the preferred choice for patients. Mini dental implants offer several benefits over traditional implants and is a featured service at our center. We can help to restore functionality and appearance in your smile. Other people who do not seek treatment to replace a missing tooth only increase the risk of other oral health and general health issues such as heart disease down the line. If you need to replace missing or infected teeth, then call us to learn how our mini dental implants can be the solution for you. – Those with insufficient bone and/or density of jawbone. With mini dental implants, patients will not have to worry about the risk of the teeth falling out when eating, speaking or laughing. Along with that, mini dental implants are durable and effective. Here is more information on the benefits of mini dental implants. While mini dental implants are smaller than the average dental implant, they still have the same effect. The mini dental implants are inserted into the jawbone through a pin hole or in the empty socket of the missing tooth. The implants consist of a titanium post that will fuse with the jawbone in a process known as osseointegration. By stimulating the jawbone, mini dental implants will also help to prevent resorption of the jaw melting away, thus preserving the facial structures and features.The process of resorption occurs when there is no tooth to stimulate a specific area of the jawbone. Without stimulation, the body will leach calcium from the jawbone for other areas of the body. This can alter the bone structure in the face and one’s overall appearance. One issue some people have when looking into traditional dental implants is that they do not have enough jawbone to support the implant and cannot get dental implants. Due to this, they may end up with dentures or another option that is not permanent. Since mini dental implants are smaller, they do not require as much bone for placement. Thus, many people who cannot get traditional dental implants supporting teeth or dentures will have a higher chance of getting mini dental implants. With dentures, people have to take them out each night to clean them. Mini dental implants remain in the jaw and only require a brief brushing and flossing routine to ensure there is no food stuck between them. Many prefer this option since there are no extra steps they need to go through to take care of the implants. When a patient needs more bone for traditional dental implants, we may recommend a bone graft procedure that adds more bone to the jaw. This can lengthen the dental implant process by several months and result in multiple appointments. With mini dental implants, it is possible to complete the entire procedure in one visit. 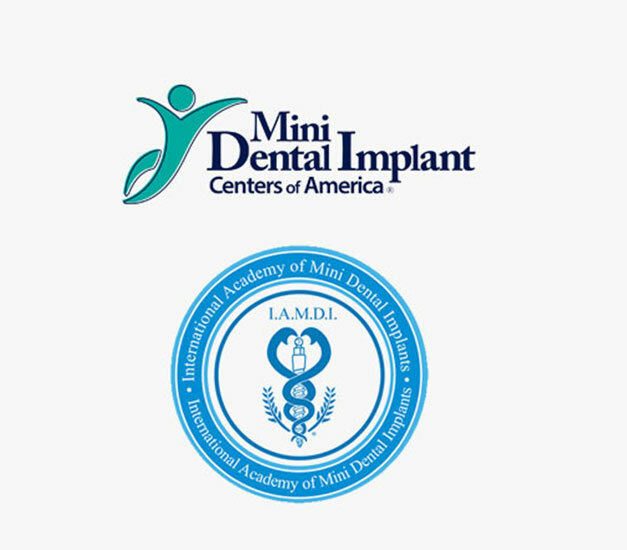 With mini dental implants, the patient will not need multiple appointments for adjustments. With most dentures, patients will need to schedule regular appointments for adjustments and relines as the jaw melts away. Fortunately, the patient may only need one follow-up appointment for mini dental implants if there are any issues. In many cases, the patient can return home and continue with a normal routine that day. The first step to seeking mini dental implants is to call us and schedule an appointment. With a faster recovery time and decreased need for extensive care, mini dental implants are an efficient tooth replacement option. You do not need to struggle with missing teeth and the resulting oral health issues. As a mini implant dentist, our treatment and oral surgery can help you replace your teeth with an effective and natural-looking solution. Restore your smile today and continue on the path toward a healthier future.